April 30 at midnight UK time is due TASK 2 of The Guild Build. 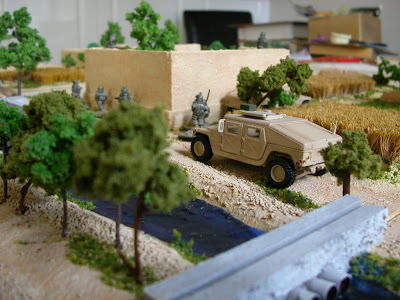 This year long project commitment can be seen on The Guild forums and my entry is to build the tabletop, terrain items and opposing forces for modern ADF operations in Afghanistan for gaming Ambush Alley and Force on Force . TASK 1 was completed in time by the end of February and can be seen in an earlier post and was simply to build a 4' x 4' gaming area out of cork tiles. TASK 2 was the completion of a large set of terrain items including a vehicle track, canal system, compounds and fields to represent settlements near or in the green zone which is the lush irrigated areas around rivers and creeks. Everything is scratched built using cork tiles, plasticard, foamcore, balsa, sand, hobby paints, superglue, PVA glue, painters medium paste, grape stem trees, model trees, flocks and clump foliage and a few other items. Now onto TASK 3 due at the end of June. This will be the compilation and painting of a number of taliban fighters and civilians. As usual, feel free to comment or make suggestions. Maybe. But I got 2 resin ones from Wartime Miniatures on my painting desk. You have been nominated by me for the Stylish Blogger Award. Click through to my blog for details. Top notch scenics there, I'm expecting the Generation Kill cast to turn up any moment.